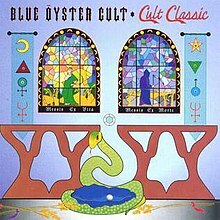 Cult Classic is the twelfth studio album by American hard rock band Blue Öyster Cult, released in 1994 and containing remakes of many of the band's previous hits. The same recording was re-issued by other labels under the titles Champions of Rock and E.T.I. Revisited in 1998 and 2004, every time with different artwork. ^ Ruhlmann, William. "Blue Öyster Cult Cult Classic review". AllMusic. Rovi Corporation. Retrieved 2012-01-13. ^ Popoff, Martin (August 2007). The Collector's Guide to Heavy Metal: Volume 3: The Nineties. Burlington, Ontario, Canada: Collector's Guide Publishing. p. 57. ISBN 978-1894959629. ^ Diehl, Matt (9 February 1995). "Album Reviews: Blue Oyster Cult - Cult Classic". Rolling Stone. Archived from the original on 2007-01-25. Retrieved 2012-04-10. This 1990s hard rock album-related article is a stub. You can help Wikipedia by expanding it.